CHARLOTTE, N.C. (AP) — In 2016, Braxton Winston stood shirtless with fist raised in front of riot police, defiantly protesting a black man's fatal shooting by a North Carolina officer. A photograph of that bold protest drew national attention amid a U.S. groundswell against the killings of young African-Americans by police. Now, a little more than a year later, Winston has taken his passion into politics, winning a seat on the Charlotte City Council. Winston, who is black, was elected Tuesday to one of four at-large council seats in North Carolina's largest city. Voters also elected the city's first African-American woman as mayor, Democrat Vi Lyles. They and others will be sworn in Dec. 4. Suddenly Winston, instead of challenging government, is part of it. "It became clear that this is what I have to do," Winston said, "to continue to be an advocate for all of Charlotte, but especially for the marginalized voices in the community." Winston, 34, who had played football at Davidson College just north of Charlotte, said he had just coached a middle school team to a football victory on Sept. 20, 2016. It was that day when Keith Lamont Scott was fatally shot by a black Charlotte-Mecklenburg officer during a police search for another person at a town home complex. The shooting would spark days of civil unrest, leading to a death, dozens of arrests and millions of dollars in damage. No charges were filed against Officer Brentley Vinson, and in August, a citizens review board voted 4-4 in announcing it wouldn't challenge the department's finding that the officer's shooting was justified. In June, the review board said it found a potential error in the police department's decision, but didn't elaborate. Friends of Winston, a father of three known for his activism, told him about the shooting. So, instead of going to his job as a stage hand or heading home to be with his visiting mother from Brooklyn, he went straight to the shooting site as a protest unfolded. 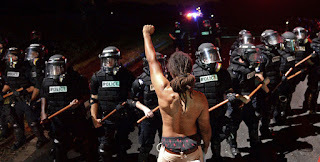 "I was about to leave and I heard Keith Lamont Scott's daughter running through the crowd and they were taking his SUV out on a flatbed," Winston told The Associated Press in an interview. "Her voice was so shrill. It was like 'That's my daddy's car! Why did you kill my daddy?'" He resolved to stay, adding, "I felt like if there was ever a time that the people had the right to be angry and express that to their government, it was at that time." Protesters threw rocks and bottles, drawing police tear gas. Winston decided to make his stand. A photographer from The Charlotte Observer captured the image. "My shirt was off because I tried to make a mask from the tear gas," he recalled. "I knew that the fist was a symbol." Winston would also join a protest outside Bank of America Stadium the following Sunday as the Carolina Panthers played a game. There he was arrested under Charlotte's extraordinary event ordinance — an ordinance since repealed — though charges were later dropped. "I felt like I was targeted," he said. After the protests subsided, Winston took his concerns to local community leaders and joined others who were dissatisfied and pressing for new leadership willing to effect change. "As the months started to creep by, the voice that I wanted to (hear) and other people wanted to (hear) wasn't showing up," he said. "It became a matter of, if not me, then who, and if not now, then when?" On Thursday, after his election, he attended a meeting at the Charlotte-Mecklenburg Government Center. He said he was pleased the community put its trust in him. "All of a sudden, now I'm responsible for administrating these systemic inequities," he told AP, vowing office-holding won't change him. "Really, I'm ready to get down to work."